get your kitchen, lounge, dining & hallway cleaned! Book your quote & cleaning demonstration today!! We offer a 14-day guarantee – if you aren’t satisfied with the results, call us within 14 days and we’ll re-clean, free of charge. WHY IS TILE AND GROUT CLEANING SO EFFECTIVE? First, we apply an alkaline-based de-greasing solution and allow it to penetrate for up to 20 minutes, loosening accumulated soil, grease and contaminants. Special surrogated brushes are used to agitate the grout lines and the tile surface. We focus on edges and baseboards too, making sure they are as clean as the middle of the floor. The tile and grout are extracted, or pressure rinsed using high pressure heated water. All waste is captured and extracted in one process. Once we've removed all remaining water from the floor, we use high powered fans to thoroughly dry the tile and grout lines. Can Electrodry protect my natural tiles? Why Should A Professional Clean My Tiles? Keeping tiled floors clean can be a tough task, and grout can be particularly stubborn, as you'll know if you've ever tried to clean the grout in the shower! It may surprise you to know that the most common cause of dirty grout is using too much water and detergent while you’re washing the floor. Here’s why. Grout is highly porous, which is what makes it effective at protecting your tiles. Unfortunately, every floor clean you do means that dirty water is being washed off the tiles and into your grout. This creates a black film that can be really difficult to remove. In humid areas like your bathroom and laundry, this black film can create a breeding ground for bacteria and mould. 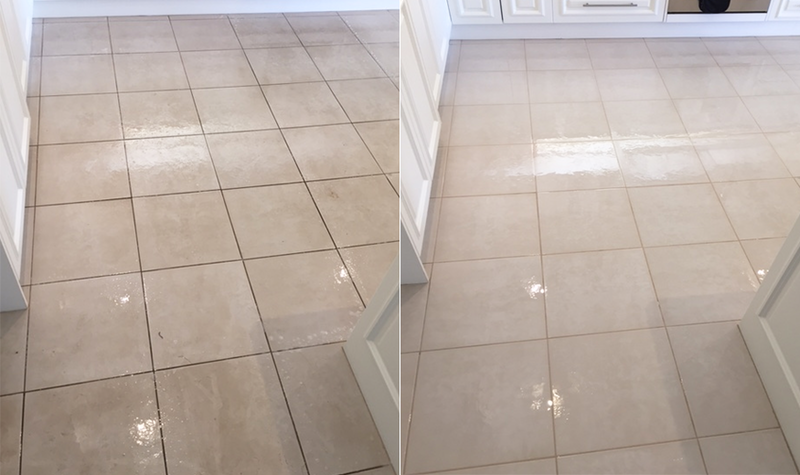 A professional clean comprises specialised solutions and equipment designed to target grout grime and give your tiles phenomenal shine! Did you know that tiles such as slate, marble and limestone are all porous and need to be sealed? Our cleaning system is safe for all-natural stone tiles and we can apply a clear, penetrating sealer to protect your tiles from dirt and impurities for many years to come. 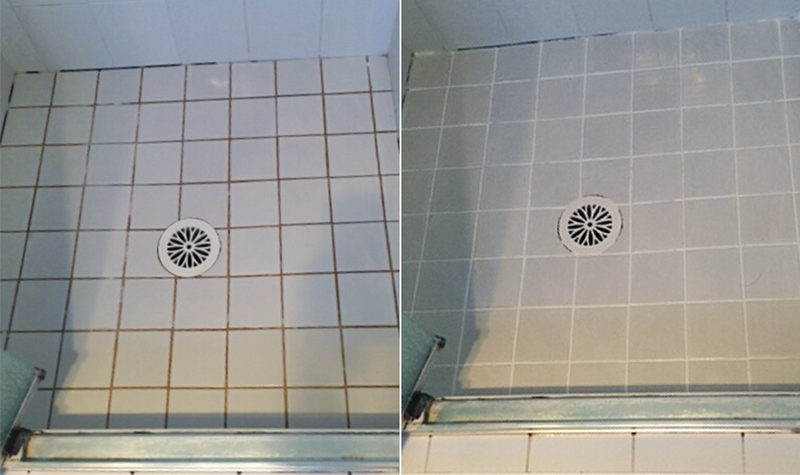 Sealing will make cleaning natural tiles easier as well, as the surface will be less porous. A clear penetrating sealer repels water and oil-based contaminants and will prevent stains. Whilst ceramic tiles are sealed, the grout between the tiles is porous and will readily absorb dirt, grease and grime. 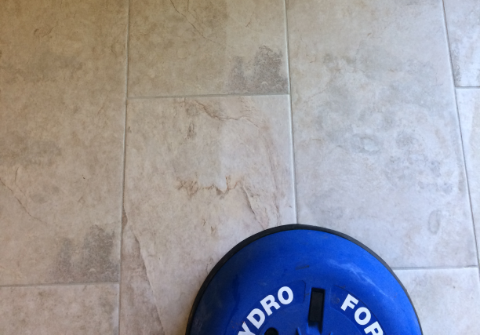 Most of this discolouration can usually be removed with professional grout cleaning, but over time, the grout will become permanently stained which detracts from the appearance of your floor. Electrodry can apply a clear penetrating sealer to your grout lines that will enable you to remove more dirt and grime during regular cleaning and help prevent permanent staining. When it comes to tile and grout cleaning, a skilled professional tile and grout cleaner will always be able to achieve the best possible cleaning results. 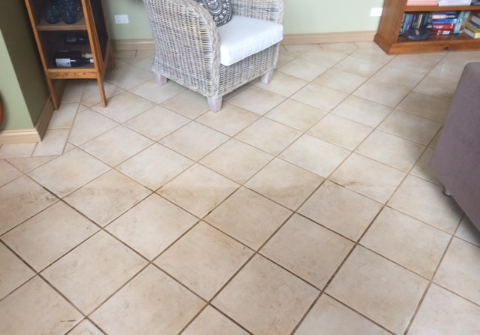 Your technician should be able to clean a sample section of your tiles during the quotation process, so you know what sort of result you’ll get from the cleaning process. Keeping tiled floors clean can be a tough task, and grout can be particularly stubborn. It may surprise you to know that the most common cause of dirty grout is using too much water and detergent while you’re washing the floor. Here’s why. Grout is highly porous, so every floor clean means that dirty water is being washed off the tiles and into your grout. This creates a black film that can be difficult to remove. In humid areas like your bathroom, this film can create a breeding ground for bacteria and mould. Whilst ceramic tiles are sealed, the grout between the tiles is porous and will readily absorb dirt, grease and grime. 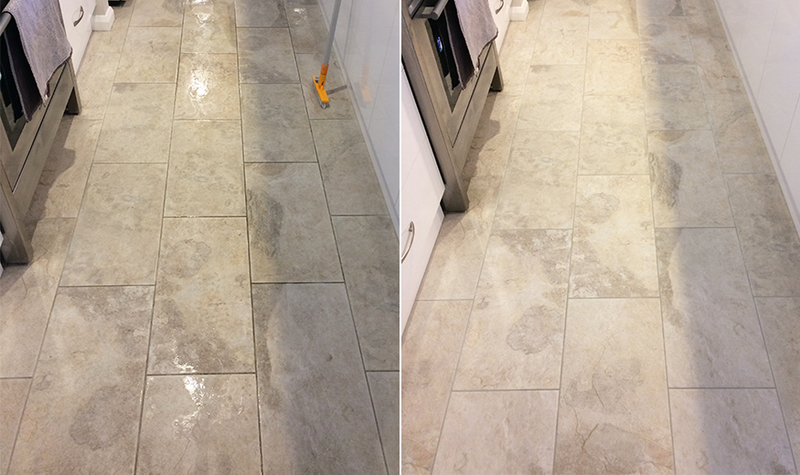 Most of this discolouration can usually be removed with professional cleaning, but over time, the grout will become permanently stained which detracts from the appearance of your floor. Electrodry gives all our clients a 14-day satisfaction guarantee. 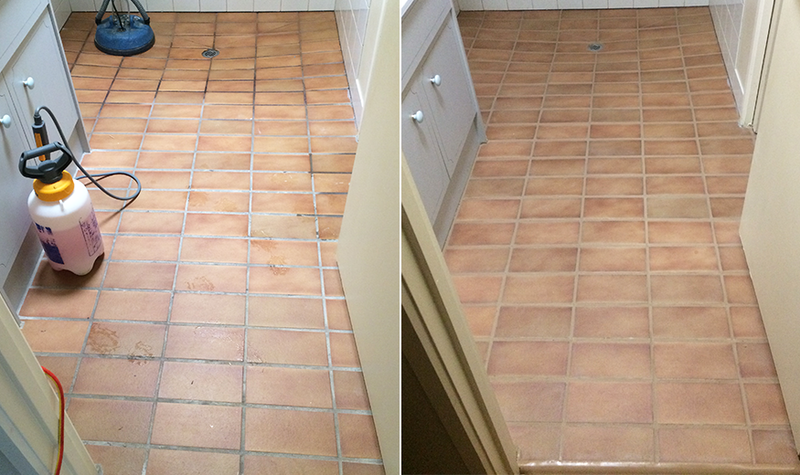 If you are not totally satisfied, we will re-clean your tiles and grout free of charge. *Offer is subject to a maximum area of 44 square metres, with 30cm square tiles. This offer is valid for a standard cleaning service. Price will vary for very heavily soiled tiles, smaller tiles or other issues that may affect the condition of the tile such as wax coatings. 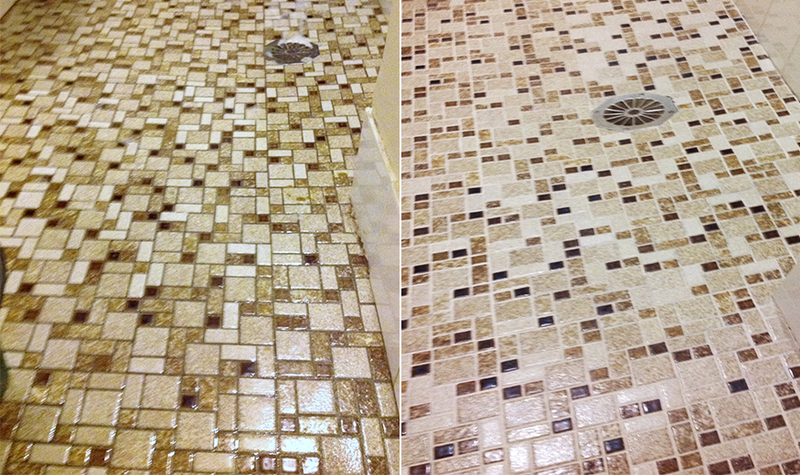 Minimum price for tile and grout cleaning service is $275 and the typical price per square metre is $7 - $10. All quotes and cleaning demonstrations shall incur a $30 fee that shall be deducted from the cleaning costs if you proceed with the quoted work or another Electrodry service. Are you after a whole new look for your tiles? Instead of re-grouting, perhaps you should think about grout re-colouring. There are more than 30 colours to choose from to rejuvenate the look of your floors and cover stains that have built up in your grout lines over the years. We guarantee the colour for 10 years (5 years in wet areas), making it a great investment for your home.